Some readers will describe In Hovering Flight as a love story, or as a tale about the complicated relationship between mothers and daughters, or about the choices that cancer forces upon you. Others may see it as the story of longtime friendships between women, or the development of an eco-activist. In truth, Hinnefeld is writing about all of these things, and she weaves them together seamlessly, in prose that is both poetic and understated. The movement of this novel is frankly a miracle, but a natural one -- like the graceful flight of a bird, gliding along a path you couldn't trace if you tried. I can't imagine how the author conceived of this structure or had any idea where she was as she was creating it. But the more I read, the more impressed I became at her gently insistent exploration. This is a book so assured and confident that it gradually teaches you how to read it. Hinnefeld moves again and again through the lives of Tom, Addie and Scarlet, revisiting the same events, letting details slowly accrue, building our understanding of these characters and their complicated friendships. A certain degree of suspense builds up, but that's not really the point. In Hovering Flight is as quiet as twilight and just as lovely. Alongside eloquent riffs on birds and the natural world, Hinnefeld has composed a pair of contained but rich coming-of-age stories: that of Addie and of Scarlet. I loved Joyce Hinnefeld’s debut novel In Hovering Flight so much that I’m at a loss for the right words to adequately portray it. How to describe this unusual novel that is part field notes of a radical environmentalist, part ornithology lecture (complete with beautiful Latin names for birds like Zenaida Macroura, more commonly known as Mourning Dove), part unconventional love story, and part confessional? In a word—breathtaking. I’ve never been one to get out the binoculars to identify the winged creatures waking me up each morning. It just might be time to start. "In this provocative and page-turning debut novel, Hinnefeld (Tell Me Everything and Other Stories) recounts the life of bird-lover, environmental activist and artist Addie Sturmer Kavanagh. Opening with Addie's death from cancer, and her troublesome dying wish—'clear orders for a brazenly illegal burial'—Hinnefeld's narrative migrates to Addie's days as a college art student, when she fell in love with birds and with the professor teaching her their biology, Tom Kavanagh. The early years of Addie and Tom's romance follows their birding and collaboration on an environmental, antiwar birding book destined to become a classic. Soon enough, though, the birth of their daughter, Scarlet, along with Addie's growing political and environmental awareness, relegate romance to the back seat. As Addie's creative vision shifts from avian homage to political tirade, the effects of her outspoken eco-outrage on her daughter, husband and two closest girlfriends are predictable but authentic, and at times moving. Hinnefeld's drama soars, especially in its depiction of Addie's complicated relationship with Scarlet, who's also trying to find her 'wings.' "
Hinnefeld (Tell Me Everything: And Other Stories) has written a rich first novel about love, loss, and the fragile beauty of nature. When intense, artistic Addie Sturmer enrolls in Professor Tom Kavanagh’s “Biology of the Birds” class at rural Burnham College, Tom recognizes in Addie his own ornithological passion and quickly falls in love with her. They marry, setting up house in a cottage in the woods, where Addie paints birds and Tom researches birdsong when he’s not teaching. But this idyllic beginning doesn’t always mirror their life together. Over the years, Addie becomes increasingly radical in her environmental concerns, and her artwork takes on a gruesome twist. Tom struggles to make Addie happy while being consumed by his own work. Their grown daughter, Scarlet, alternately rebels against her counterculture parents and struggles through her poetry to embrace her conflicting feelings about Addie. But when Addie is in the last stages of cancer, the characters reunite to deal with their demons and to find some measure of peace with each other. Particularly notable for its engrossing details about bird life, this moving book is strongly recommended for all fiction collections. "In Hovering Flight ranges from before Scarlet was born up to 2002 when Addie passes away from breast cancer. A number of powerful environmental issues are discussed—particularly the danger of the pesticides and chemicals that are found in the ground, water, and air. Addie also stands out as a strong woman, never backing down and always insistent that the world needed saving and that she could save it." "This highly original novel makes interesting points about love and life, while tracing a daughter's debt to her unusual mother." In her first novel, Hinnefeld, an acclaimed short-story writer and a Moravian College professor, introduces Scarlet Kavanagh, the grown daughter of Tom, an ornithologist in south-eastern Pennsylvania, and Addie, a famous bird artist and environmental activist who is dying of cancer. The crux of the story is Scarlet's quest to find peace in her strained relationship with Addie, but Hinnefeld jumps from voice to voice to relate intertwined plots—the love story between Tom and Addie; the tragedies and friendships that have shaped the small family. It all adds up to a story that is deep and believable, largely because Hinnefeld seems to know (and love) that of which she writes—birding, the Pennsylvania countryside, the Jersey Shore, and her engaging characters. In Hovering Flight tells the story of Addie Sturmer Kavanagh, an activist and “bird artist” whose failing health has spurred her 34-year-old daughter, Scarlet, to come home. Hinnefeld uses this narrative hook to explore topics both obvious (family relations, illness and death) and unexpected (the delicate nature of our eco-systems and the importance of art) in a musical prose style that evokes the very birds she clearly covets. "The characters and relationships of In Hovering Flight are the backbone of the novel, but Hinnefeld’s descriptions of nature's effects on the characters are no less impressive. Unlike other novels based on natural elements, such as Marilyn Robinson’s Housekeeping or Barbara Kingsolver’s Prodigal Summer, the characters aren’t used to flesh out the environment. Instead, it’s the other way around. Hinnefeld uses the birds and woods in her novel to enhance the personalities and relationships of her major characters." In Hovering Flight crept up on me, and it was especially through young Addie’s character that I felt the story took off. 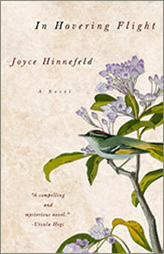 Her determination to do something with her artistic ability and then her discovery of birds, which become the cornerstone of every decision that follows, made for very compelling reading. . . . Hinnefeld has written the story of a woman possessed, and what becomes of everyone else around her. It is a stirring novel about art and life and love that very quietly sweeps the reader along. In Hovering Flight, Joyce Hinnefeld's glorious first novel, is, therefore, the perfect book for me this weekend. Perfect because it is about birds, ecology, mothers and daughters. Perfect because so much of it takes place not far from my own part of the world, in Bucks County. Perfect because if it is masterfully wrought—quiet yet momentous, cohering, heartfull, whole. Hinnefeld is a gifted, informed, intelligent writer—careful, tender, never excessive—and in unraveling this story about a bird-loving professor and the student who becomes his wife, this story about their daughter, this story about eco-activism and a decision to die, Hinnefeld yields what feels to be a true, uncompromised story in language clear as bird call. Hinnefeld’s narrative voice can be best described as elegant, with a rhythm that carries along the story with surety and wisdom. From the opening sentence—“According to John James Audubon, there was once a species of bird in southeastern Pennsylvania, the Cuvier’s kinglet, Regulus cuvieri, or, as Audubon liked to call it, Cuvier’s wren,” the prose never struggles in this tale of a family both united and torn apart by their mutual love of birds, words, and art, and of the woman central to it all." In Hinnefeld’s novel the natural world, an artist’s vision, the intensity of long-lasting love, the flight of a bird’s song and the sighting of an extinct-or perhaps illusory-small creature all work to shape the plot of the novel. This book is not so much about Addie's death, but really about her life and her passions. It's a story about relationships, conflicts, nature and love. A beautiful family drama, that will make you as the reader understand Addie's strange last request, and make it seem not so strange after all. "That the story of an ornithology professor's life, his artistic wife, and single daughter can inform the way we view progress, the environment, marriage, suicide, autism, terrorism, and addiction sounds ambitious at best. But Hinnefeld's subtle weaving of personal and public in a first novel make her a wonderful discovery for this author, and for fans of Ann Tyler, Carrie Brown, and Ann Patchett." "Hinnefeld’s writing is poetic, sensitive and evocative. I was touched by the very real struggles of her characters - their failed dreams, their conflicted love for each other, their doubts and triumphs. This debut novel is simply a joy to read - one which resonates with the songs of birds and the grace of the human spirit." Exploring family relationships and the conflict between artistic passion and family love, this book takes us deep inside the lives of all three Kavanaghs and by the end I felt I knew these people. I also sort of wanted to go bird watching. Highly, highly recommended. "This is a beautifully written, richly layered novel. Joyce Hinnefeld has painted a realistic and powerful story about the ways that relationships change over time, between husband and wife, parent and child, even close friends. And her lovely, lyrical prose make it a book that is not to be missed." From the TBR Pile, "In Hovering Flight"
The Inkblotter at The King’s English, "For the Birds"
Fresh Ink Books, "In Hovering Flight by Joyce Hinnefeld"
Chasing Ray, "Climate notes from a polar explorer, World War II in graphic novel form and observing the human condition"
Joyce Hinnefeld has written a wonderful first novel. Love, loss, and the delicate beauty of nature are all explored within these richly written pages. Absorbing details about bird life fascinate, but at its core, In Hovering Flight is really about what it means to find your "wings." Quietly impressive, In Hovering Flight opens with the death of one its protagonists, Addie Sturmer Kavanagh, bird artist, environmental activist and mother. Her academic husband Tom, her daughter Scarlet, a poet, and her college friends Lou and Cora are gathered together to mourn her. It is 2002, but the novel soon travels to 1965, when Tom and Addie first fell in love. It oscillates gently between past and present, and between the perspectives of Addie, Scarlet, and, to a lesser extent, Tom. One of the loveliest things about the book is its layered structure: it doesn't just go back and forth but revisits the same moments, gradually revealing more detail, thus creating a finely textured portrait. Hinnefeld is also good at exploring different forms of love between people without descending to bathos. The love between Tom and Addie develops beyond the early excitement of romance, and their love for their daughter is profound, if complicated, especially for Addie, who finds it hard to reconcile the competing tugs of motherhood and creativity. And when she becomes politically aware, she endangers all her relationships with her despairing vehemence. In Hovering Flight integrates its many concerns (love, art, the natural world and mortality are the most obvious) successfully. Sure to be a favourite with reading groups, this is a rich novel written with assurance. This first novel, set in Pennsylvania, opens in 2002 with a death. The artist Addie Sturmer, her ornithologist husband, Tom Kavanagh, and their daughter Scarlet, a poet, are gathered in the home of their friend Cora while Addie dies from cancer. Strictly speaking, it opens with a note on a rare bird called the Cuviers kinglet, described by John James Audubon in 1812, and, perhaps, seen again by Addie near their own home the year before she dies. The story travels back and forth in time. The first meeting of Addie and Tom is in the mid-1960s. She is an artist in his bird biology class, with her friends Cora and Lou. Their relationship is slightly scandalous, he being 10 years older and divorced, she his student. Why did Addie, who everyone - including herself - thought was going to be an English teacher, decide to change course? She discovered she could draw and paint, and she heard a bird singing. She did not know what bird it was then, but she did realise the song was nothing less than the voice of all her unnamed longing. Joyce Hinnefeld takes us on their journey as Addie comes to be obsessed with the damage humans do to the environment. She loses touch with others through her distorted focus, and with herself. Her artwork suffers, her daughter drifts away. But her passion also inspires, in unexpected places. This meditative work of fiction creeps up on you slowly, as Hinnefeld slowly unwraps the live of three members of a family during and after the mother's death from cancer. Alternating between past and present, Hinnefeld explores complicated family relationships through parents Addie and Tom and their grown daughter, Scarlett. Birds and nature are a motif, as Tom is a bird biologist and Addie a renowned bird artist who became an environmentalist. As the family prepares for Addie's death, Scarlett tries to come to terms with her complex feelings for her mother. This is a novel you come to not for plot but for gentle probing into the inner lives of loved one. Scarlet Kavanagh has returned from New York to Pennsylvania to see her mother Addie die painfully from cancer and to help her father bury his environmental evangelist wife secretly and illegally. Addie and Tom are two academics who are inspired an driven by the beauty of nature and in particular the song of the birds living within it, and each one strives to unconditionally love and support the other throughout their marriage. Hinnefeld's inspired intertwining of the study of birds perfectly echoes the beauty of love and fragility found in human relationships. Tom sees his wife physically and spiritually fade into illness and despair and his daughter still struggling to find her own place in a world surrounded by secrets and heartache and wonders at his own strength to endure or help either of them. The story unfolds in the past and present through the use of bird watching manuals, recalled conversations and the devotion for Addie help by two college roommates Cora and Lou who have their own skeletons to hide and resolution to find. Part environmental statement, part love story, it is all-engrossing and a wonderful read.